Welcome to the New Atlantean website. We offer many excellent publications on vaccines, holistic health, natural parenting, conscious childcare, and personal growth. Some of the books in our online catalog were published by New Atlantean Press. Others were chosen by our editorial review team because they are among the best available on each topic. We also offer some holistic products. For example, herbal fiberblend is an excellent body cleanse and detoxifier. Take your time visiting. When you are ready to buy, just add items to your cart and proceed to checkout. You can also order by email or phone. Miller's Review of Critical Vaccine Studies. Many people sincerely believe that all vaccines are safe, adverse reactions are rare, and no peer-reviewed scientific studies exist showing that vaccines can cause harm. This book provides the other side of the story that is not commonly told. It contains summaries of 400 important scientific papers to help parents and researchers enhance their understanding of vaccinations. Meet Dr. Mayer Eisenstein and several other authors representing books that are published by New Atlantean Press. 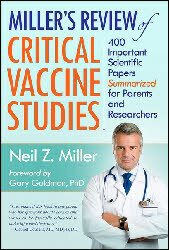 Meet Neil Z. Miller, the author of the Vaccine Safety Manual and Vaccines, Are They Really Safe and Effective? The Vaccine Safety Manual is the world's most complete guide to vaccine risks and protection. Important information on every major vaccine. More than 100 charts, graphs and illustrations supplement the text. An important addition to every family’s home library that will be referred to again and again.